Last week, Dr. Saichuk handled some insect related rice field calls. I thought you’d like to learn about his observations and how he recommended handling the pest problems. The problems were reported on the Louisiana crop blog. Click here for a link to a field Johnny scouted that had a thrips infestation. Learn more about thrips in rice at this link. Click here for a field Johnny scouted that had a rice water weevil adult infestation that was causing defoliation and death of seedlings. Click here for a fact sheet on rice water weevils. Armyworms have recently been reported causing injury in Arkansas rice. Click here for a report I read in Oryza news this morning about the armyworm situation in Arkansas. I haven’t had calls about armyworms in Louisiana this season, but we should be aware of the situation with armyworms moving from wheat to rice. A similar situation could occur in Louisiana. The Louisiana wheat crop is maturing more quickly than usual and Sebe Brown recently reported army worms in wheat in north Louisiana. So, if you are scouting a rice field near a wheat field, you should watch out for armyworms in the wheat that may march over into the rice. Click here for a fact sheet on armyworms in rice. If you treated your rice with Dermacor X-100 seed treatment it should be protected from armyworm injury. If you used CruiserMaxx or NipsitInside seed treatment you will not have protection from armyworms. Keep this in mind as you make your scouting plans this season. Nick Colligan is resuming Karen Nix’s dissertation research studying the relationship between planting date and rice water weevil infestation levels in untreated rice fields. The first field he will sample is located in Vermilion Parish. The field went to flood on Saturday and we will pull core samples in 4 weeks. I’ll let you know what we find. Over the weekend Sebe Brown scouted a field in Concordia parish where the stand was being severely reduced by colaspis larvae feeding on seedlings. Problems with this field started on March 16 when the stand began to decline. The plants were described as yellow and stunted. This was a Dermacor X-100 treated hybrid rice field no-till drill-planted at a 23 lbs/acre seeding rate. Surrounding fields were growing nicely. When Sebe scouted the field on Saturday he confirmed that the injury was being caused by Colaspis larvae feeding on the roots of seedlings. The stand was reduced about 40% by this injury. The recommendation was made to establish a shallow permanent flood to avoid further injury. In a situation like this, where the rice isn’t quite ready for a flood, you may lose some injured plants to the flood. The alternative is to wait to establish flood, during which time the colaspis will continue to injure the seedlings and further reduce the stand. Establishment of a flood on the field will prevent further feeding injury by the colaspis larvae and eventually the larvae will die. Note: according to experts in Arkansas it may take up to a month for colaspis larvae to die in the permanent flood. Click here to read more about colaspis. You can watch a video on how to scout for colaspis here. The Dermacor X-100 should provide about 30% suppression of the colaspis infestation. Next season, they will consider using a CruiserMaxx or NipsitInside seed treatment to target control of colaspis. The use of pyrethroids will not provide control of colaspis because they are injuring the crop below the soil line. 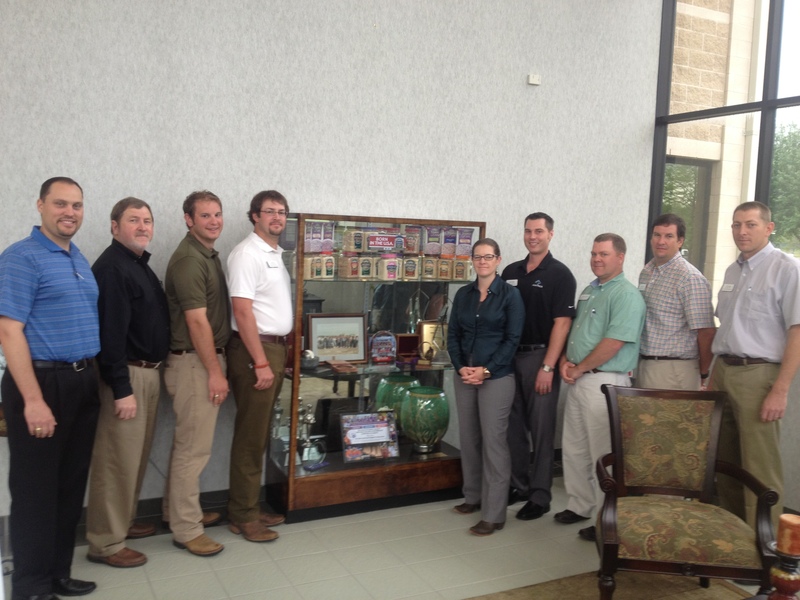 On our final day in Texas we toured the RiceTec facility in Alvin, TX and Doguet’s rice mill. 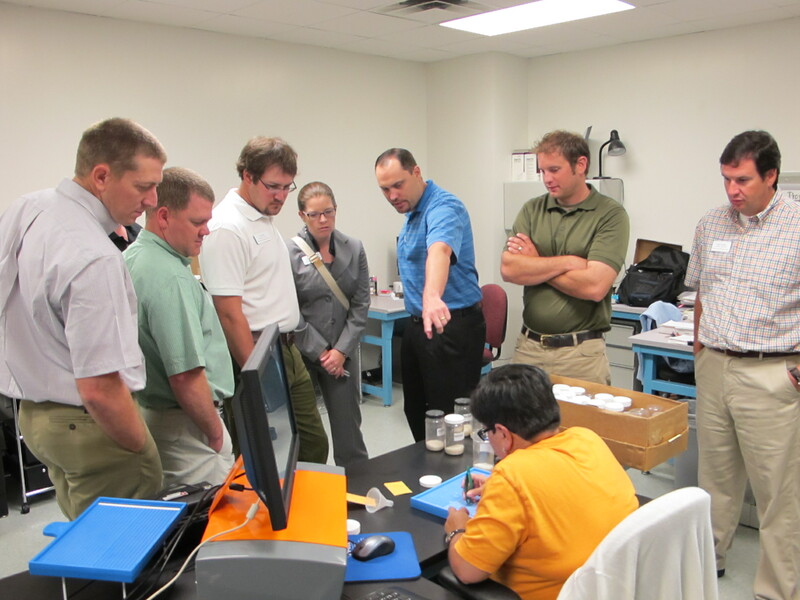 At RiceTec we learned about their seed business unit (SBU) and consumer business unit (CBU). The SBU is focused on developing hybrid rice varieties, while the CBU focuses on marketing specialized rice products to consumers. Rice Tec has five physical locations: Texas, Arkansas, Puerto Rico, Mercosur (Brazil) and India. The facility at Alvin, TX is a 500 acre farm where rice land is rotated with soybeans. RiceTec is not immune to the water shortages in Texas and they have been affected by the water restrictions implemented this production season. RiceTec is a full-integrated company, employing more than 200 people from many continents. The company activities range from breeding, contract growing, and milling of rice to packaging, branding and marketing of specialty rice to consumers. Improvements in varieties are driven by customer needs. RiceTec is one of a few agricultural companies that only focuses on rice. This seed scanner machine measures grain size dimensions to check for uniformity. RiceTec began in 1988 with the first hybrid rice crosses. At that time, the company was called “Farms of Texas”. RiceTec was officially formed in 1990. In 2000, the first hybrid rice variety (XL6) was sold by RiceTec. The first Clearfield variety was released in 2001, and the first hybrid with Clearfield qualities was sold in 2003. Currently, XL745 is the most popular long grain rice variety grown in the US. 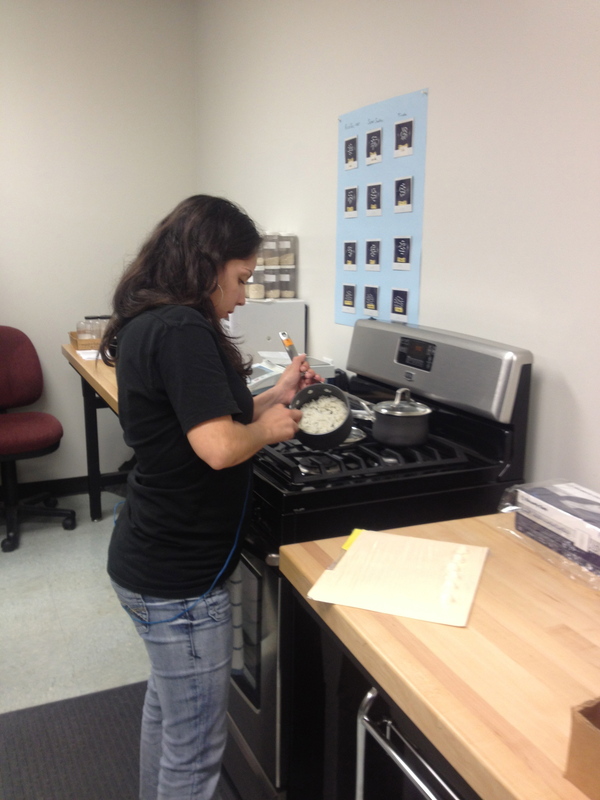 A technician evaluating the cooking qualities of rice varieties. Many people ask the question: what is hybrid rice? Hybrid rice is a cross between two distantly related parents. The offspring of this cross benefit from the phenomenon referred to as “hybrid vigor”: consistently higher yields than conventional rice varieties. Rice has a perfect flower, perfect in the sense that both male and female structures are present in the flower. This allows rice to self-pollinate. One of the challenges of hybrid rice breeding is the development of female sterile lines, which allow for the crossing of two varieties. The difficulty lies in distributing pollen from the male line to the female sterile line. RiceTec developed a mechanized hybrid seed production by planting female and male lines in blocks in a field and then using a helicopter to move the pollen between the two parent lines. Hybrid rice was first produced in 1974. Currently, 60% of rice hectares in China are planted in hybrid rice varieties. Due to the enhanced yield potential of rice, growers can intensify production on less land. This ability to intensify crop production in a sustainable matter is critical to the support of our growing global population. The impact of hybrid rice production in China is significant. More than 40 million acres of hybrid rice varieties are planted in China. On average, the hybrid varieties have a 20% yield advantage over conventional varieties. This increase in yield potential, feeds 60 million more people each year! Hybrid varieties allow farmers to grow more food on less land, sustainably, and feed more people. Greenhouse facilities used for variety development. One of the critical issues facing farmers across the globe is the challenge of crop production intensification using sustainable practices. Hybrid rice varieties fit within this paradigm, because they are in their nature a sustainable product. Hybrids offer increased per capita grain yields, higher fertilizer efficiency, higher water use efficiency, lower production costs per hundred weight of rice produced, and disease and insect resistance (thus less pesticide use). After Brian Otis concluded his presentation on the Seed Business side of RiceTec, we heard a brief presentation on the Consumer Business at RiceTec. This information was all new to me. I was not aware of the RiceSelect company. RiceSelect only sells premium rice and grains. The company is vertically integrated from seed to plate, distributing proprietary varieties of rice that are grown in Texas. RiceSelect has been in business for 30 years and was the first company to produce and distribute aromatic rice grown in the US. The CBU conducts studies of customer preference and marketing. RiceSelect is the only major brand of rice packed in a resealable jar, which improves the package appearance of their product on the shelf and maintains the quality of the rice. RiceSelect products are grown on American family farms, are rated US no 1 grade, and can be purchased in white, brown, light brown and organic. Light brown rice has gone through one phase of milling and still has some bran intact on the grain, improving the fiber content. 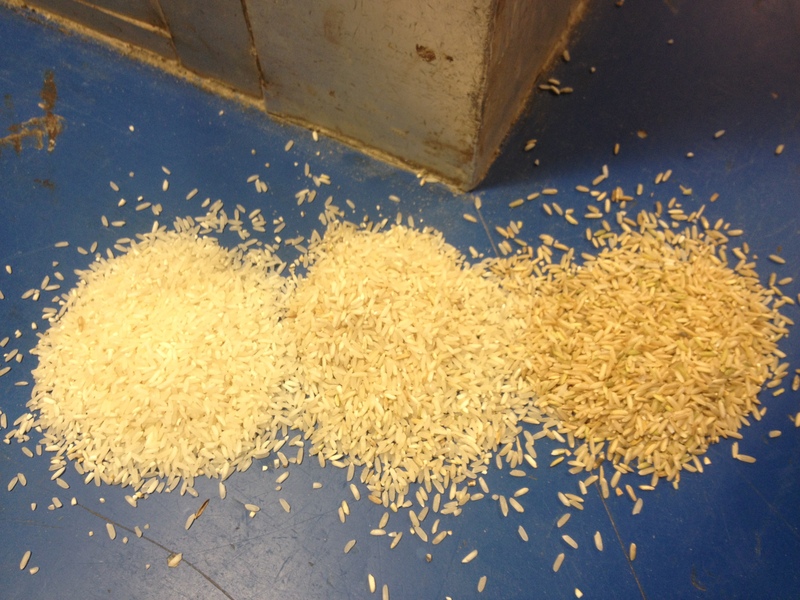 The photo below contains (right to left) brown rice, light brown and white rice. RiceSelect has a strong focus on environmental stewardship. They strive to produce a high quality product that is nutritious, provides ease of use to the customer, is non-genetically modified, and has low environmental impact. These stewardship principles are applied from the rice field, to the processing, packaging, and distribution of the product. They graciously provided us with some of their RiceSelect Texmati rice. I cooked it for dinner on Saturday night and was pleased with the freshness, texture and flavor of the product. RiceTec is one of the sponsors of the Rice Leadership program and we greatly appreciate their support. I am pleased to announce the release of the beta version of LSU AgCenter RiceScout app! The app was partially funded by a grant from the Southern Region IPM center and the Louisiana Rice Research Board. We greatly appreciate their support of this project. The creation of RiceScout was a tremendous team effort, including contributions from many faculty at LSU AgCenter, University of Arkansas and Texas AgriLife. The app was programmed by the Information Technology service unit at LSU AgCenter and editing was completed by the LSU AgCenter Communications service unit. Full credits to all authors and contributors can be found in the “About” section in the app. Special credit is due to Anna Meszaros who directed this project from start to finish. The RiceScout app contains images, descriptions, and management information on insects, diseases and weeds that commonly occur in southeastern rice producing states. Information on crop fertility is also included. The purpose of the app to increase the speed and accuracy of rice fertility and integrated pest management crop decisions. Please share this link with your contacts in the rice industry. The app should function on most smart phones and web browsers. Send an email to ricescout@agcenter.lsu.edu if you experience any technical difficulties or find an errors in the app. We are in the process of developing a stand-alone app for the iPhone, iPad and Android – in the meantime, you can use this web-based version in locations where you have access to data on your phone. To use the app, open up the link (http://ricescout.lsuagcenter.com) in your web-browser. A “splash” screen with the logo of the app will appear briefly on the screen while the app is loading in your browser. Once the app loads, you can use the touch screen on your smart phone to navigate through the content on the app. When you open the image galleries, you can navigate through the images by swiping on the phone screen. You can also zoom in for greater detail. Links to scouting videos and control recommendations can be opened up using links to websites within the app. Hope your rice crop is moving along nicely. The rice I have seen in southeast Louisiana looks good. I am currently touring across the southeastern US rice production area as a member of the 23rd USA Rice Leadership Development Program class. This is the first of four sessions we will complete over the next two years. I’m enjoying the time with my fellow classmates who hail from across the US rice production regions. USA Rice Leadership 2012 Class (from left to right) Timothy Gertson from Texas, Rance Daniels from Missouri, Brian Barrett from California, Clint Roth from Arkansas, Brice Lauppe from California, myself and Noble Guedon from Mississippi and Louisiana. 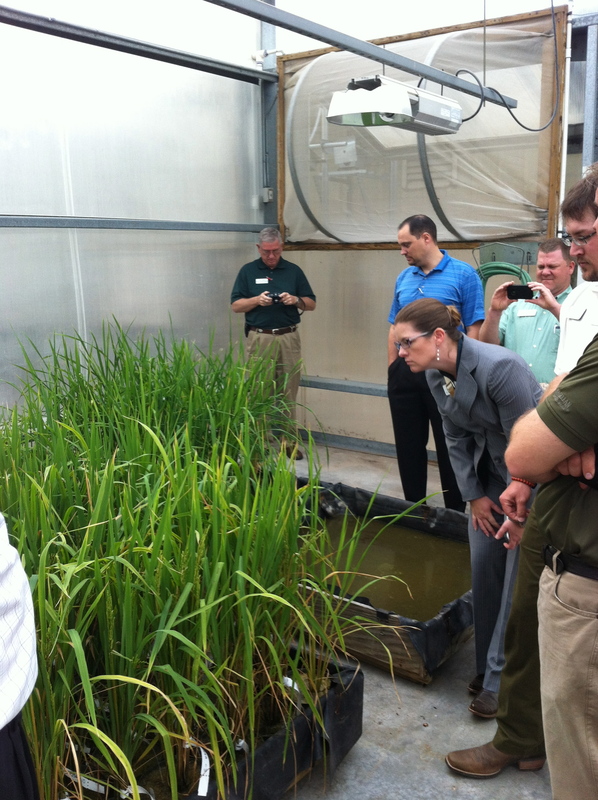 The Rice Leadership Development program is administered by The Rice Foundation, an organization dedicated to rice industry research and education. About 85% of US rice acreage is represented by the USA Rice Federation, while the other 15% is represented by the US Rice Producers Association. The Vision of the USA Rice Federation is to be the driving force of a profitable and unified US rice industry. After we learned about the structure and purpose of the Federation, Bill Farmer spoke about US rice exports to Canada, Asia and Mexico. Mexico is a growing export market for US rice. Cooking demonstrations and TV shows are used to promote rice consumption in Mexico. After Mr. Farmer’s comments, we learned about the rice brokerage business from Michael Creed, of Creed Rice. You can visit riceonline.com to learn more about rice trading and the Creed Rice Report. 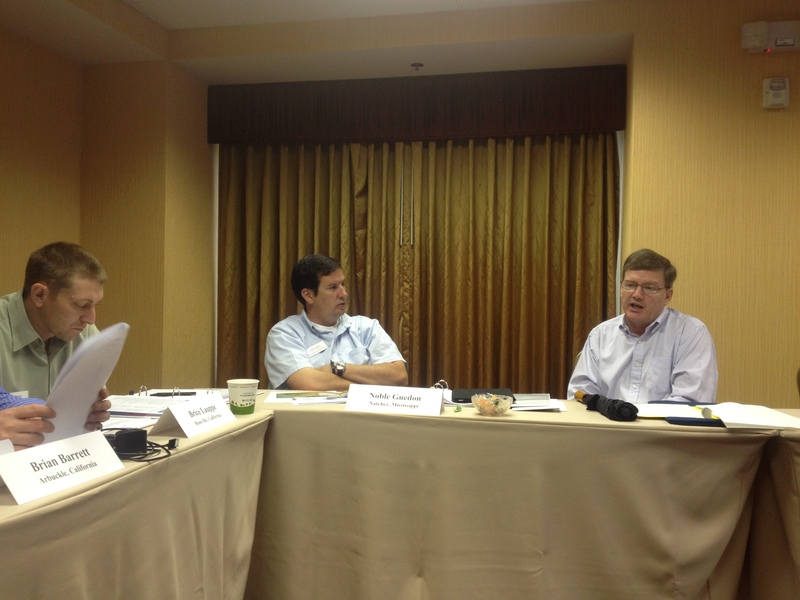 In this photo: Brice Lauppe and Noble Guedon discussing rice trading with Michael Creed. 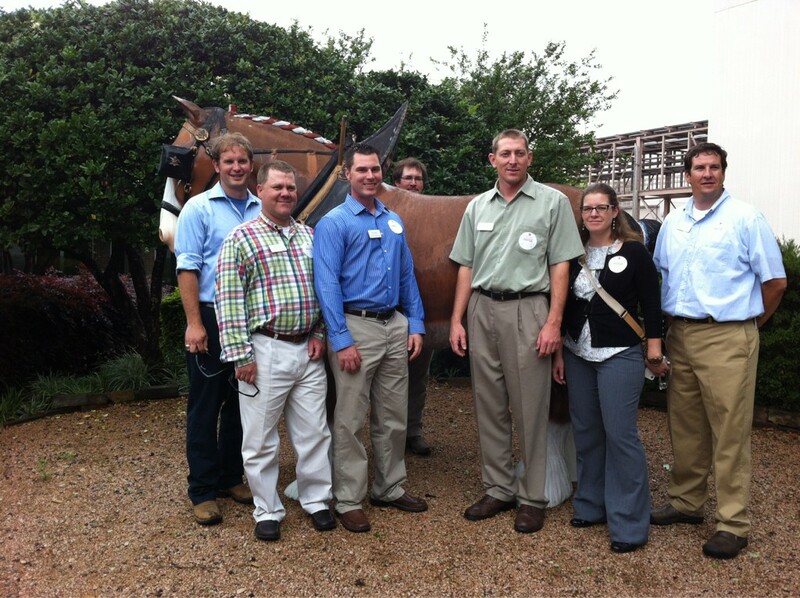 In the afternoon, we toured the Anheuser-Busch plant in Houston, TX. One of the Brewer’s led our tour, which focused primarily on the brewing process. Anheuser-Busch is the largest domestic consumer of US grown rice. Rice is a key ingredient in many Budweiser products. 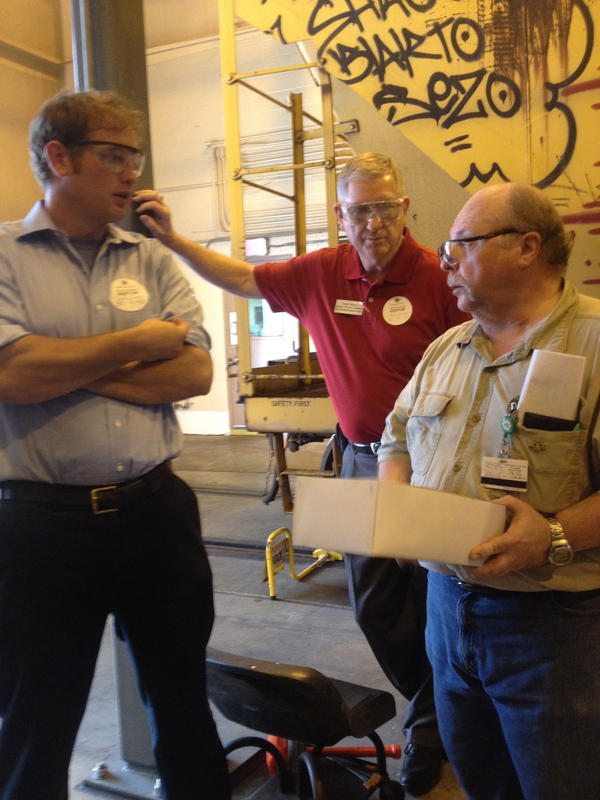 In this picture – Tim Gerston and Chuck Wilson (USA Rice Federation) discussing grain deliveries with a brewer. One of the most interesting things about the tour was the sights and smells. If you’ve ever brewed beer then you’ll be familiar with a lot of terms like wort, hops, and sparge – all terms that apply to specific phases of beer production. The mechanical processes used to produce beer on a commercial scale are remarkable. One thing I did not know is that the Lager is held in “Chips” tanks for a period of time before bottling. 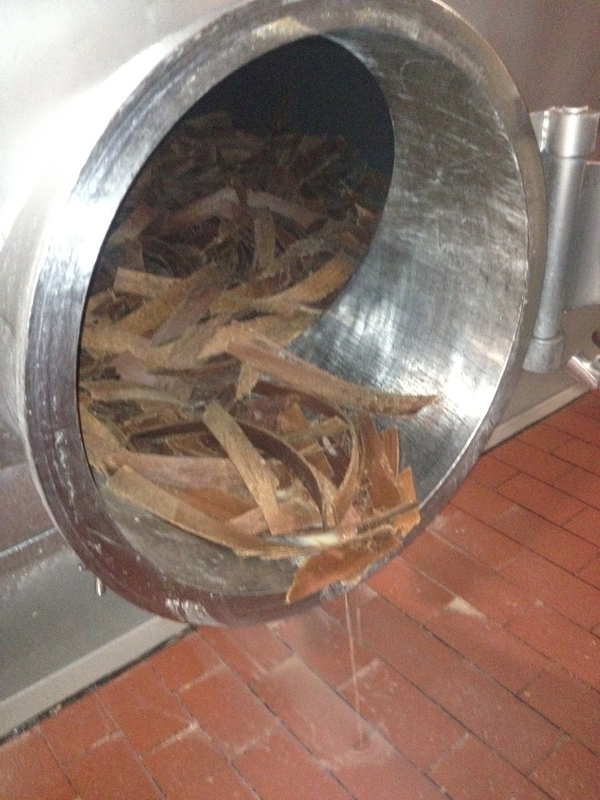 These tanks contain beech chips and are a traditional final step in beer brewing used by Anheuser (see photo below). On our second day in Texas, we struck out bright and early to visit the headquarters of Riviana Foods in Houston. The Riviana brand originated in Louisiana and the name is derived from a combination of “river” and “Louisiana”. Riviana has developed into a $1.2 billion corporation that is currently owned by Ebro Foods, a Spanish company. They distribute and market a variety of rice products as indicated in the photo below. Riviana and private label make up 50% of the US rice market. Riviana sells about 25 pounds of rice per second. While Mahatma is their no. 1 brand of rice, they are seeing great growth in the aromatic rice sector. 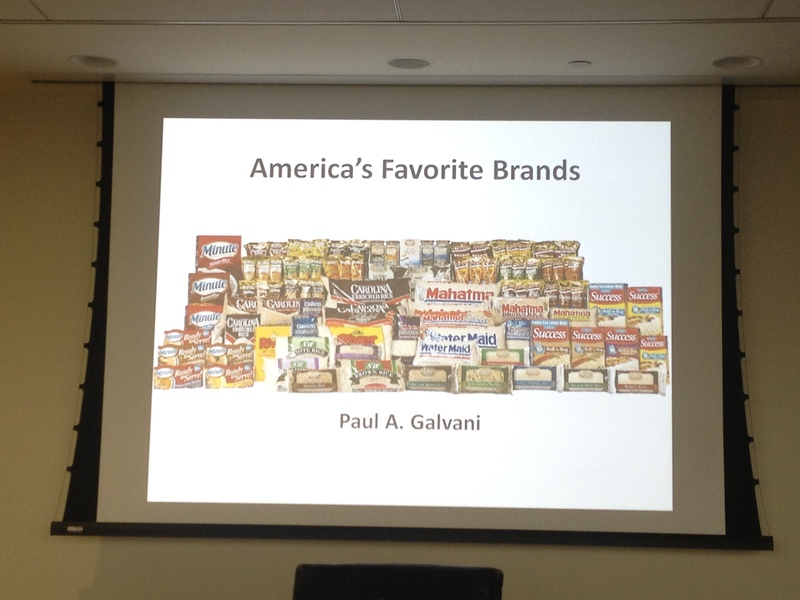 During the presentation by their marketing director, Paul Galvani, we spent a lot of time discussing the increasing demand for ready-to-serve rice products. During our trip across Texas, we also visited the US Rice Producers Association, Hlavinka equipment, the Gerston Farm in Libbey, Texas, and Rice Belt Warehouse. The conversation in Texas focused on water issues. Due to water shortages, about 70,000 rice acres will not be planted in Texas this year. The TX acreage reduction will impact farmers, but also millers, seed merchandisers, equipment dealers and other supporting industries. Linda Raun met us at the Hvalinka Equipment Company. Mrs. Raun is a Texas rice farmer, graduate of the Leadership Progam, and current Chair of the USA Rice Producers Group. She traveled with us to the Gertson farm and spent time discussing the history of rice production in Texas. 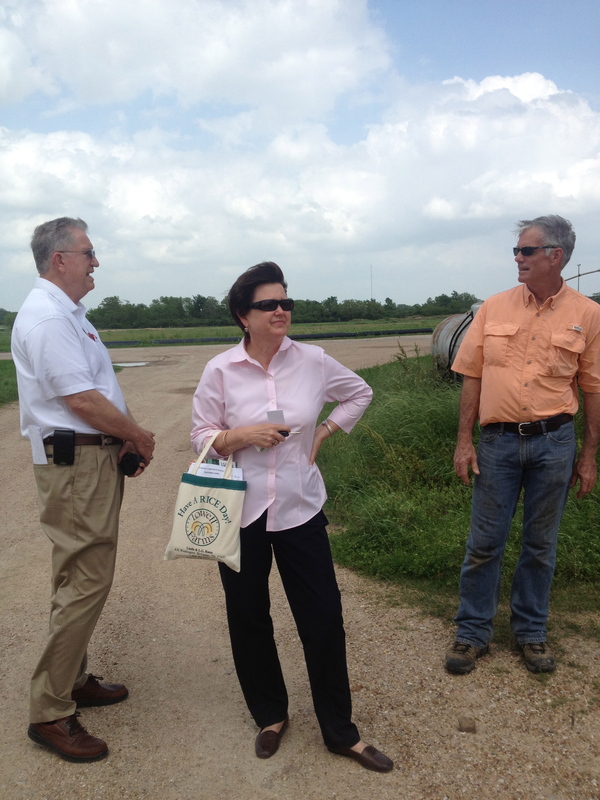 In this picture: Chuck Wilson, Linda Raun and Mr. Gerston (Texas rice farmer). The Gertson’s have an impressive amount of diversification on their farm which includes a rice and cattle rotation, machine shop, precision farming equipment, and a flying service. On our second day in Texas, we visited Doguet’s rice mill and RiceTec before we crossed the Sabine into Louisiana. I’ll pause for now and tell you more about our visit to RiceTec in my next post. If you want to follow us real time – follow the hashtag #usarice23 in twitter. You can also follow my tweets @NatHummel.